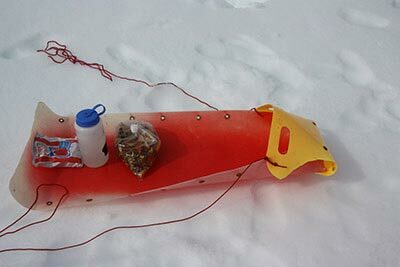 A lightweight toboggan, known as a "boggy", is an excellent way to carry additional weight on snow. It can be easily made from a kids sliding toy known as a Crazy Carpet (brand name Krazy Karpet). 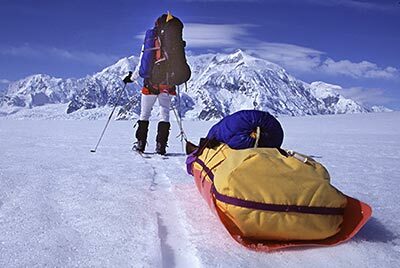 The toboggan is easy to pull and can be used comfortably on moderate slopes with loads of 10-15kg. 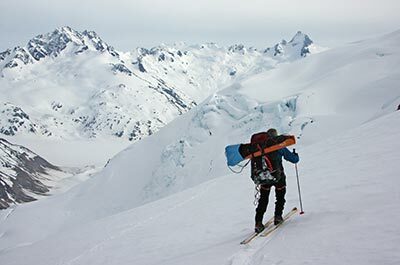 It usually works well to carry a week's supply of food in most terrain and on flatter valley glaciers it is practical to carry up to 2 week's food and gear in the toboggan. 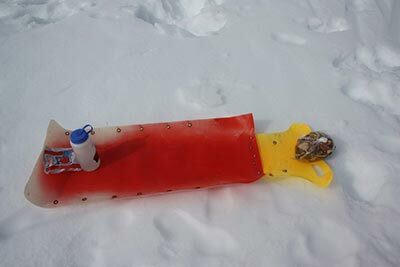 The toboggan is collapsible and can be carried rolled up when not in use. The toboggan is made from a full Krazy Karpet with an additional piece that is riveted on to form the front of the toboggan. 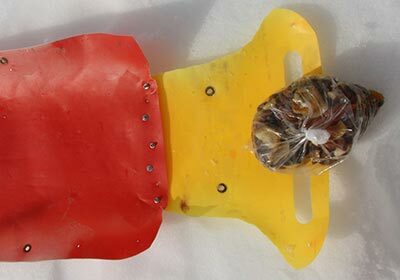 The front piece is shaped to keep snow out of the toboggan and to allow the toboggan to slide sideways when needed. To assemble the toboggan tie the front ends of the main Krazy Karpet with a short cord to form a cyclinder. Bend the front cowling down over the front of the toboggan and tie in the first holes along the side. 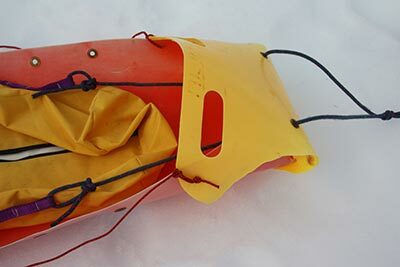 A large custom made stuff sack with a zipper in the top is recommended for carrying the load in the toboggan. 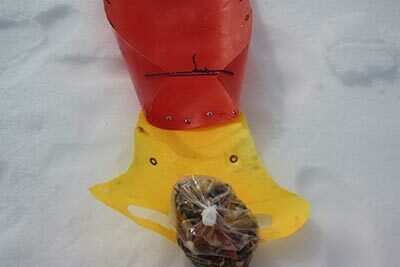 Feed the main haul lines through the front of the toboggan and tie the haul lines to reinforced attachment points on the stuff sack. 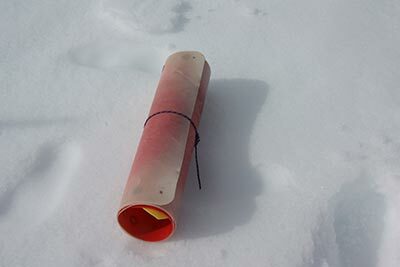 Lace the main cylinder of the toboggan around the stuff sack using lighweight cord. 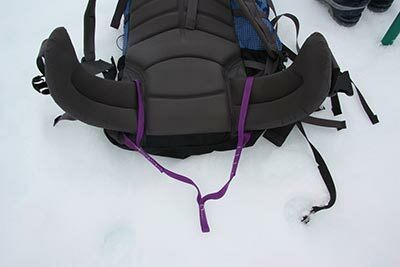 Attach the haul line for the toboggan to the hipbelt of your pack using webbing and a lighweight carabiner. A loop of heavy shock cord is recommended in the haul line to even out the pull of the toboggan as you walk. The toboggan is designed to slide sideways when necessary and is generally easy to manage on sidehills. 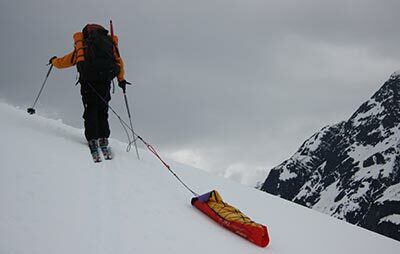 On steep slopes the toboggan can be picked up and carried on the top of your pack.